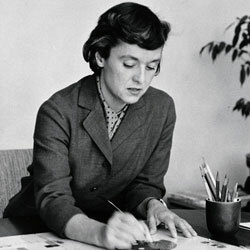 Florence Knoll (originally Schust), was born in Saginaw, Michigan in 1917. Today, she is recognized as an artistic icon, and a pioneer of Mid-Century modern design. Her education took place at the Kingswood School in Michigan, on the campus of the Cranbrook Academy, and in the 1930s she quickly earned her place as the protégée of world-famous designer, Eero Saarinen, while studying architecture at the Armor Institute and Architectural Association in London. As she pursued her love of design, Florence Knoll Bassett progressed to work within various different architectural firms, as well as for other influential designers, such as Marcel Breuer, before she finally met Hans Knoll – the man she married in 1946. Florence Knoll quickly convinced her husband that his furniture company could serve to benefit more from conducting business with an interior design service that worked alongside architects. Subsequently, the masterpiece of Knoll Associates came into being. Florence Knoll’s Mid-Century modern designs served to transform the traditional image of the American workplace, from the drab, dark, and confined places of the past, to light and open spaces. Through her architectural training, Knoll strove to create spaces that made sense according to the perspective of the user. At the time, the norm of interior design focused on closed-off spaces and richly carved desks and Knoll commented that her biggest challenge was attempting to change that mind-set. Fortunately, her dedication to spacious design gradually took hold and Florence Knoll became famous for her concept of “total design”, allowing her to revolutionize the way that interior space was planned and managed. As the director of the Knoll planning unit, she embraced space with fervor, changing the way that people thought about manufacturing, interior design, and architecture forever. The proponent of humanized modernism, an amazing architect and innovative designer Knoll has helped to steer the direction of interior design into the world that we know today, while producing some of the most iconic Mid-Century modern furniture pieces of the 20th century. As the director of the Knoll Planning Unit, Florence consistently pursued the concept of Mid-Century modern furniture design with the image of larger space in mind. To her, the most important aspect to consider was how well a certain piece could fit into the greater design in question – such as the room, the floor, or even the entire building. Because of this, each aspect within a Knoll-planned space incorporated the concept of a connected design; one which complemented the existing architecture. In her refusal to compromise, Florence Knoll regularly designed furniture intended to fill the gap left by pieces that she “needed” to complete a space. Although she never completely defined herself as a designer of furniture, her quest for consistency in design and harmony of space lead her to produce many of the most iconic pieces ever introduced by Knoll. Contrastingly to many of her peers, such as Saarinen and Bertoia, Knoll’s designs were architectural, rather than sculptural in their foundation. She scaled down the details and rhythms of modern architecture and attempted to humanize them through the careful use of texture and color. Her lounge collection, including the sofa, loveseat, and chair is a perfect example of her geometric and devoted approach to furniture. The lounge collection is constructed using simple, yet far from boring, architectural lines with a framework intended to last a lifetime. 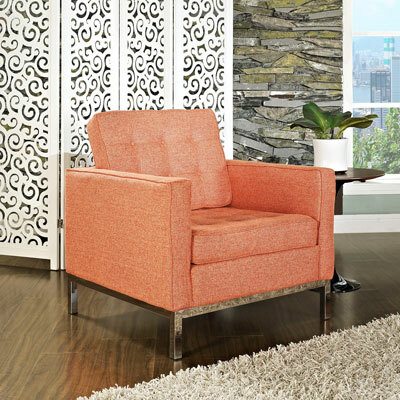 Close inspection of the collection reveals hints of inspiration from Knoll’s favorite mentor, Mies van der Rohe, the sofa, loveseat, and chair can easily be recognized as classics of Mid-Century modern design. Anyone with a desire to understand the true essence and spirit of Mid-Century modern design need search no further than the thoroughly functional and economic pieces produced by Florence Knoll. Mrs. Knoll Bassett quickly established herself as one of the most innovative and influential interior planners within America and perhaps one of the most memorable designers of the second half of the twentieth century. Knoll’s pieces were created according to her belief in “total design” – a concept that manufacturing, architecture, interior design, graphics, textiles, and furniture should all be integrated into furnishing, spatial planning, and decorating in a seamless way. Often, studying the lives of famous designers and architects reveals a relatively solitary lifestyle and approach to their work with much nameless assistance blending into the background. However, Florence Knoll had a special gift when it came to collaborating with others as well as promoting and recognizing pieces of great beauty and worth. 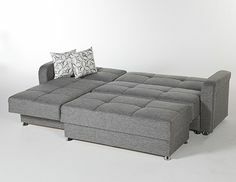 After helping to create, and for a time, run Knoll Furniture, Florence designed numerous regional showrooms around Los Angeles, San Francisco, Chicago, New York, and Milan that served to showcase the company’s products with great Mid-Century modern style. Today, she is credited with elevating the standards of manufacturing furniture to an entirely new level of quality. Now, many of the pieces of furniture commissioned and designed by Knoll herself are recognized in decorative arts and modern design collections throughout major art museums around the country, in Europe, and Canada. In total, Knoll designed approximately 108 pieces in the period between 1948 and 1960, before her retirement in 1965. This amounted to nearly half of the products found within the Knoll line. Florence Knoll even designed her own archive to be donated to the Archives of American Art in 2000, curating the entire contents of the collection, as well as arranging every paper into portfolios and color-coded files. Through her dedication to the importance of space and light in working spaces Knoll has effectively changed the attitude that surrounds the working office and the atmosphere that can be achieved within working spaces. She has also served to alter the way future designers consider their conceptualization of pieces, introducing a concept of “total design” which creates perfect harmony throughout homes, offices, and other buildings alike. Today, Knoll is recognized as a designer of Mid-Century modern furniture that played a significant part in the way that we see the world today and she continues to inspire upcoming designers in the pursuit of functional beauty. This entry was posted on Wednesday, April 1st, 2015 at 4:27 pm	and is filed under Mid-Century Designers. You can follow any responses to this entry through the RSS 2.0 feed. Both comments and pings are currently closed.